A fall outdoor wedding has a stunning natural backdrop of golden, red, and orange colors. Colorado has incredible scenery too immaculate and romantic to pass up, but you will need to find a way to bring in some heat as the night progresses. The right tenting and heating and a few warm decorative touches will keep your guests warm for your outdoor fall wedding. Add sidewalls with windows for your outdoor wedding tent. The first thing you need to get is the right tent for the season. We’ve got a large selection of wedding tents, some more elaborate and grand than others. 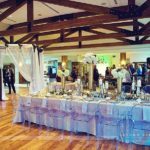 Your guest list will help you narrow down your tenting options, as the tent should be big enough to house your entire wedding party, plus include plenty of space for your guests and your catering staff to move about comfortably between the tables. White pole tents are perfect for big outdoor weddings. One thing that we do recommend is that you remember to add sidewalls to your wedding tent to shield your guests from the cold. You can have sidewalls that are solid white, or you can choose sidewalls that come with clear windows so you aren’t shielding yourself from the surrounding views and landscape. After all, it’s the Colorado fall foliage that makes an outdoor wedding so special. Add a subfloor to your outdoor wedding tent to keep your guests off of the cold ground. To avoid handing out wool socks and having all of your guests wear clunky winter boots to your wedding, be sure to add a subfloor to your tent. The ground is going to be the coldest as the temperature drops. By putting in a subfloor, you will allow your guests to wear their fancy party shoes without freezing their toes off by the end of the night. Sidewalls and a subfloor will help control the temperature inside your wedding tent, but you also want to add a few heaters to keep your guests warm. Although the late night dancing will help keep the blood flowing, you want to add a few heaters around the wedding tent to keep your guests warm during the dinner, as well as those that would rather sit and mingle than be on the dance floor. Don’t forget to rent generators to go with your heating devices. Unless you have access to the right outlets near your outdoor venue. Have hot drinks at the bar to keep your guests warm. Every wedding tent needs a bar area. For a fall wedding, make sure that you add a few hot drinks to the menu. Hot toddies and hot chocolate are a great addition to a fall wedding. Warming your hands and your heart with a big mug of delicious hot cocoa is going to go over well with both the adults and the kids. We provide clear tops, tent liners, string light packages, subflooring, heating, and everything else that you could want under a tent! Browse our selection of tents, shade canopies, and custom built enclosures. Different tent sizes are available upon request. Give us a call for a quote and more information.